Some of you may already know that we went "glamping" for Memorial Day weekend. That means camping with the "extra" amenities. The only words that come to mind as I am typing this post is priceless times. 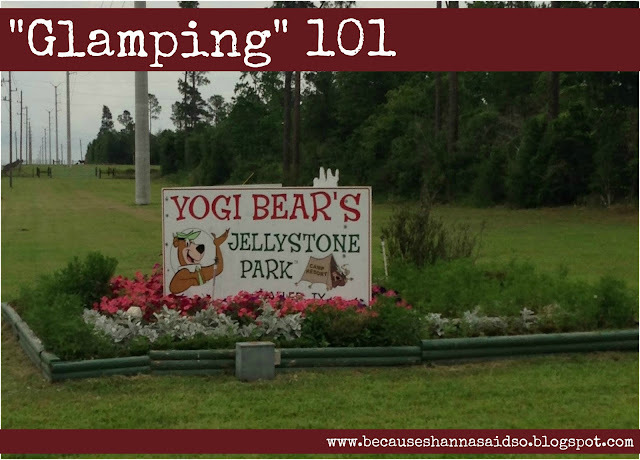 Oh, the stories that I could tell; better yet, the stories that the Jellystone campgrounds could tell. Oh my word. 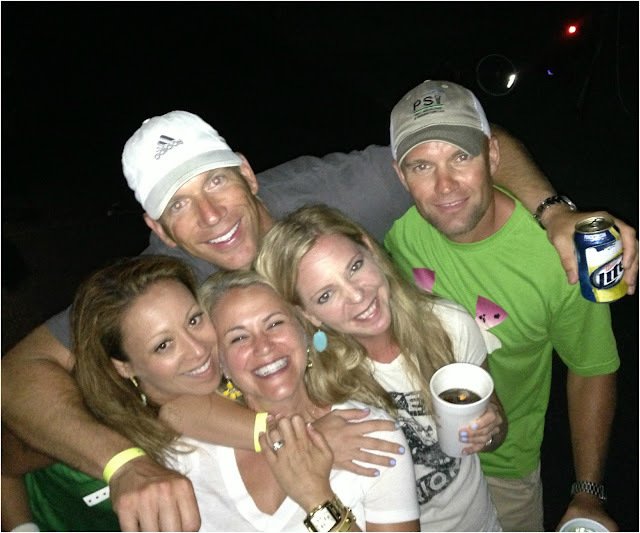 Nothing but good times, late nights, lots of sun, old and new friendships, camp food, water slides, weddings, celebrities and memories. Curious? Keep reading. For the record, if any of you want to join us next year for the Memorial Day weekend extravaganza, book your spot next month. Here is the website. That's how hot this ticket is. I promise, it will be a three day weekend to remember. Can't wait for 2014. 1. Book a cabin if one is available at the park you are staying at. It is way too much work to "RV" it. Poor Ross. I don't know how he did it...between pulling this massive concoction, to hooking it up and then dragging it home...lots of exhausting work after a loooooong weekend. We will 100% be paying the extra money to stay in a cabin next year. 2. Make sure you pick a campground with a pool. This is a MUST. Throw in a few trashy, gossip magazines, mommy juice, crazy kids, adult floaties and best friends. 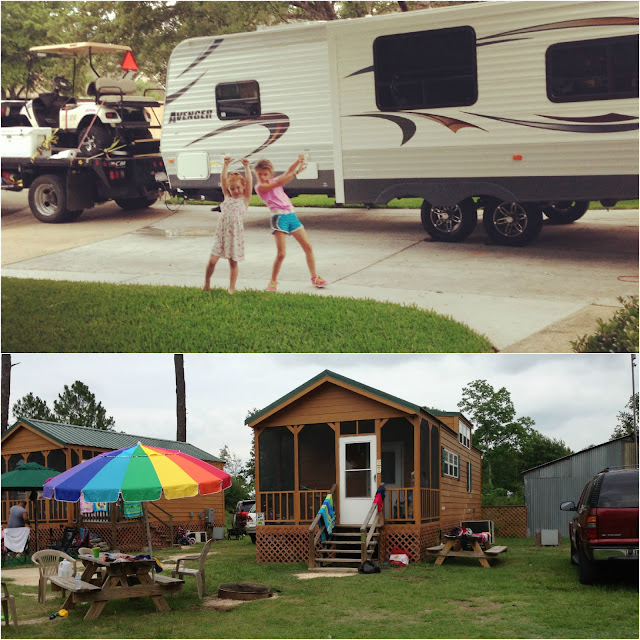 Your "glamping" trip is well on it's way to sucess. 3. Next up are the "glamping" accessories. 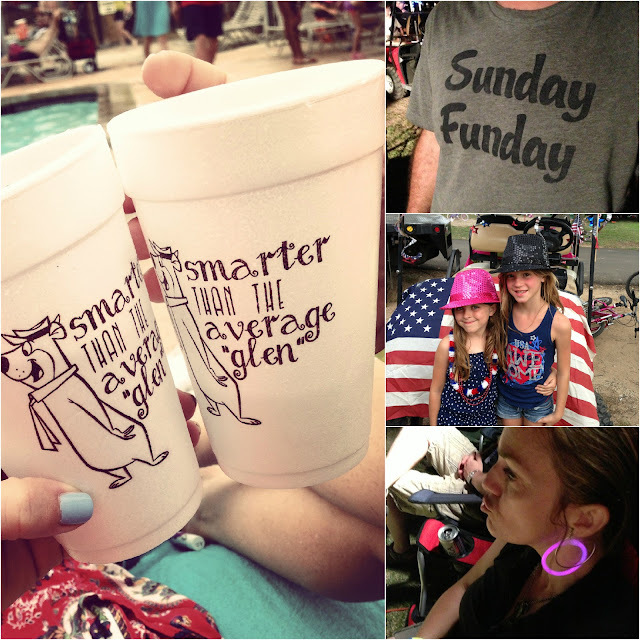 It is imperative that your organized friends order and pack themed Styrofoam cups, sport glow in the dark jewelry, dress for the occasion (insert red, white & blue) and wear t-shirts that sum up the weekend. Everyone loves Sunday Funday, right? Right! 4. 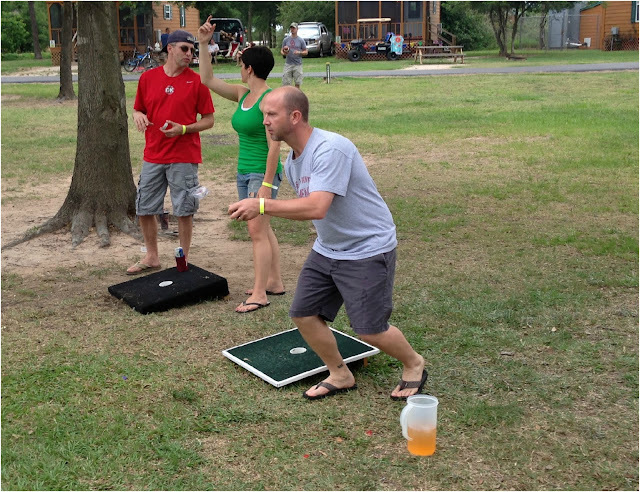 Pack fun, competitive games such as washers. This will keep the men distracted long enough for the women to actually sit down and gossip. Don't forget the pitchers of the spiked lemonade for when you get really thirsty. See picture above. Want the recipe for what's in the pitcher? Email me. 5. This is where it gets interesting. Wondering what this picture is all about? Let me explain. We locked ourselves out of our camper. We were given some expert "glamping" advice from a fellow camper: crawl through the storage area and look for the "secret" door/slot to the inside of your camper. This was an ultimate team effort. Ross popped the secret hatch and we sent our oldest in for the mission to be accomplished. All was finally well on travel trailer road. I am not going to lie. I started crying alligator tears, moved onto laughing hysterically and finally gave utter thankfulness and praise to God. Crisis moment averted. 5. 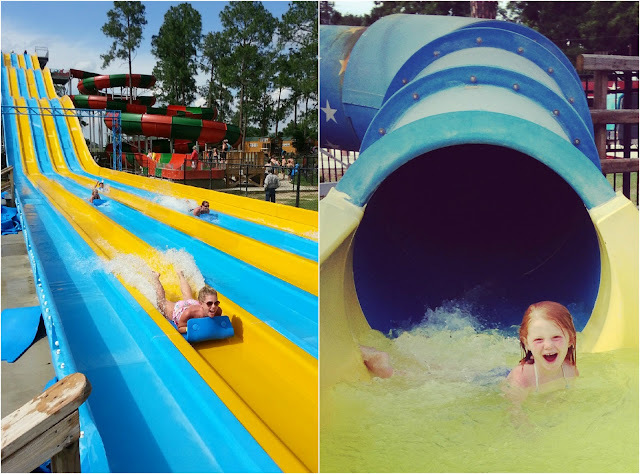 Your "glamping" camp site must have water slides installed. It doesn't matter the shape, size or color, they just has to be present. 6. 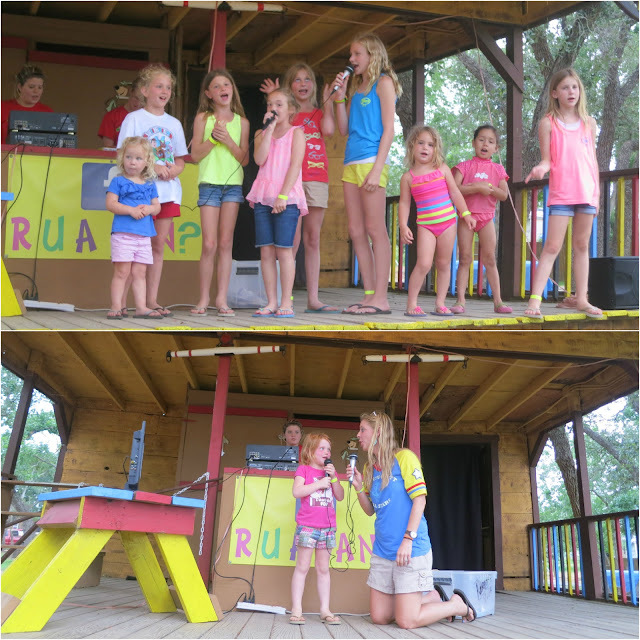 Signing up for the karaoke talent show is one to put on your list. It is required that you sing something from Taylor Swift or Adele. All the cool kids are doing it. 7. Be prepared for a wedding. Yes, weddings take place while "glamping". 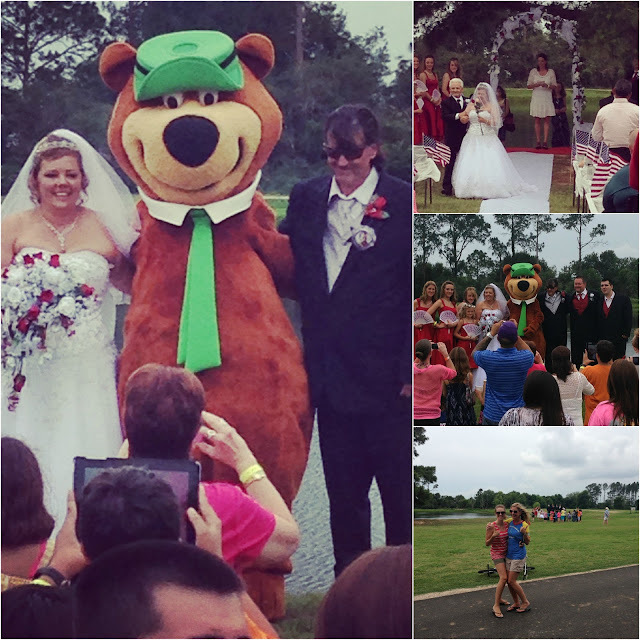 I am still in awe that I witnessed Yogi Bear being part of a wedding party. It was real, classic love that I will never forget. And yes, the bride and groom spent their honeymoon on the campgrounds. True, undying love, I tell you. Just call me the unofficial wedding photographer. I have about 50 on my iPhone. I was in the moment. 8. Camp food. Bring it. A grill, chips, dips, buns, burgers, smores and Miller Lite in the background. We tend to keep things classy. 9. 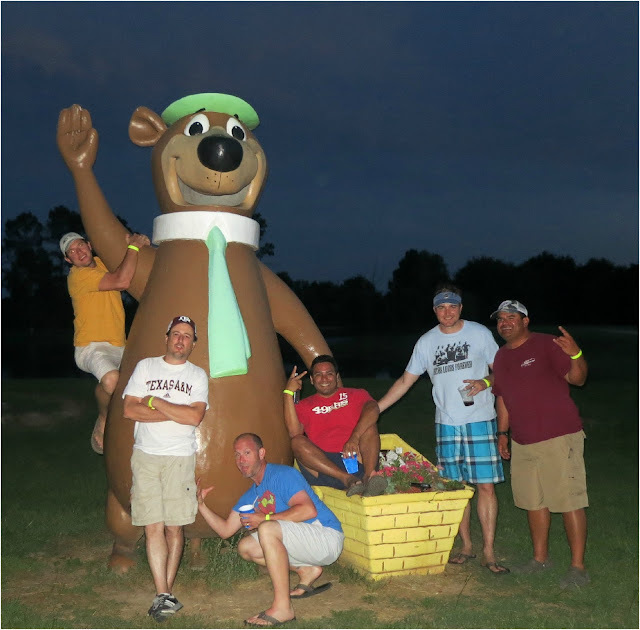 Take a picture with the campground mascot. It should be one of the most important things on your agenda. 10. If you plan to glamp during a holiday weekend be prepared to go all out with themed golf cart decor, parades and throwing candy to your camping patrons. 11. Glamping isn't just for the "Average Joe". 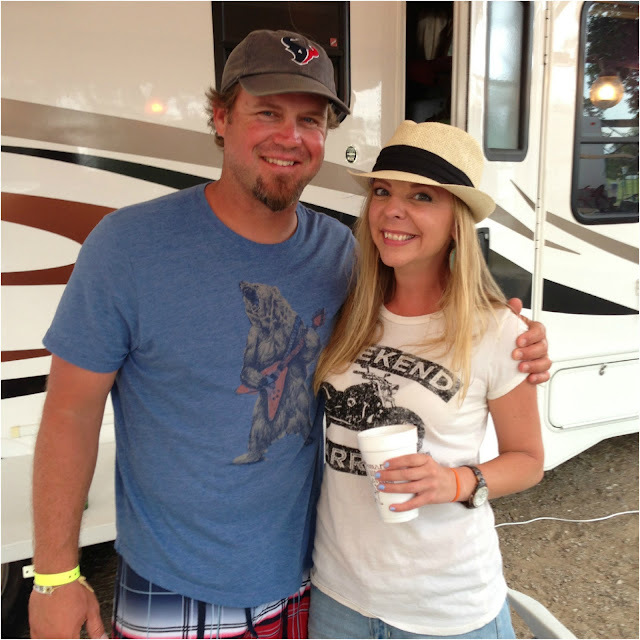 Glampers come in all shapes and forms including a Houston Texans football player. I had the pleasure of meeting the one and only Shane Lechler, a 10 million dollar punter for the Texans. 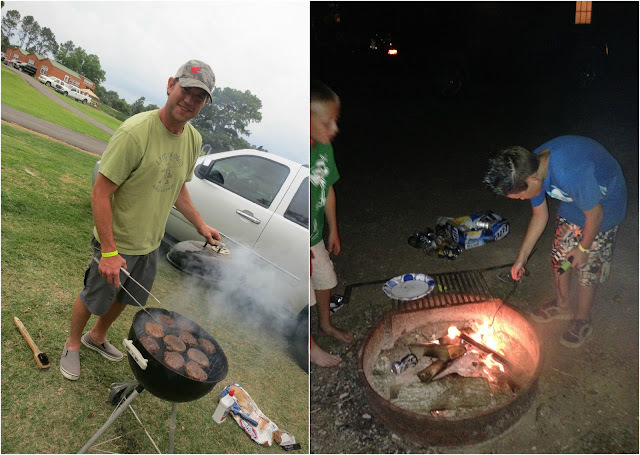 We played washers with him and his wife as they RV'd it with us two campsites down. Hey, it's good to know celebs can glamp it up too. Can you tell how giddy I was in this picture? Lame, I know. 12. Last but not least, be prepared to make LOTS of new "glamping" friends. Everyone in this photo, minus my buddy in the white hat are brand-spanking new friends that I have already become Facebook official with. No lie, I made 20 new BFFs over the weekend. Glampers unite. This weekend was by far one of the best. I can't stop looking at all my pictures and reliving the memories made. I cannot wait until next year. Who needs a trip to the beach, mountains or a vineyard when you have Jellystone "glamping". This was one for the books and I highly recommend that you give it a whirl. Linking up with Sami, Molly & Carly. This looks so fun! I much prefer glamping over camping. 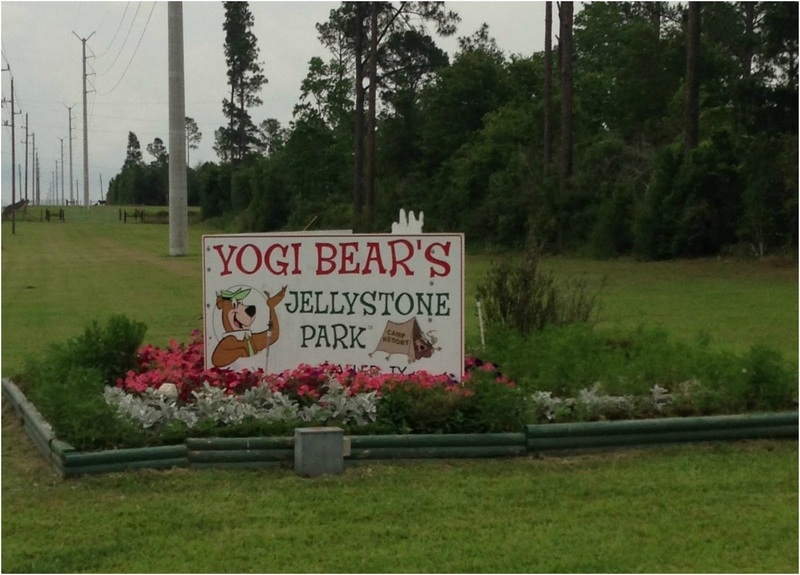 Also...I totally thought you were kidding when I saw on Titter that you were at Jellystone! This word, "glamping" is new to me, but I must admit I think I might actually enjoy it! I am not a camper, at all. A cabin may work for me, though. Looks like you had tons of fun!! that looks like a fun weekend and glamping may very well be the ONLY kind of camping this girl would ever do!! That water slide looks like too much fun!! Wow it looks like you had a wonderful weekend! I just love the picture of the guy with water wings! Fun! I love hanging out with friends pools side, fun to go glamping too! I just love warm weather! =) Cute pics! I love camping/glamping! This looks like so much fun! Awesome! I can't believe you met a celebrity!!!!!!! EEEKKK! This looks like a fun weekend! You guys did so much! 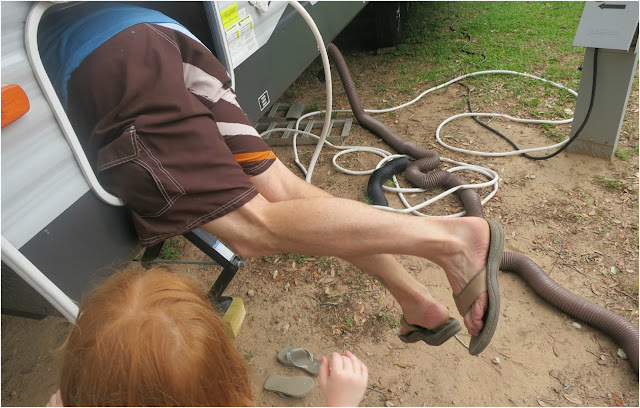 We are going camping this summer but no way would I do it without an RV or cabin. I need to glamp. seriously I am SO jealous, that looks like the BEST time everrr! It looks like you had such an amazing weekend!! These photos are so cute & fun! Glad you had a great little getaway, m'dear! xo! I still can't get over that wedding. Ahhhh!!! loved seeing all your instagram pictures and want to be in your family!!! Ever since I first heard Alexis on RHOC say glamping, I've been wanting to go! Looks like so much fun, and yes a pool is a must! I don't know how people have fun sitting outside in the heat sweating without a way to cool off. Haha loooveeee that you call in glamping. It looks like you guys had the best time! This looks like so much fun! I've only been camping a few times (never glamping!) and I seriously feel like I missed out on a huge part of the day now. I think I need a MDW do-over. I am dying over the wedding photos with Yogi Bear! I wanna party with you...you always look like you're having SO much fun! What an awesome, fun-filled weekend!! i thought i was good at glamping, but girl you have me beat! this is awesome! never heard of glamping, but i want in on the action! looks like it was a fun time!! Looks like so much fun. Glamping is great. I'm hoping to do that when we go camping in August. Hit up the spa while the boys play on the beach. I have been looking at all those insta's waiting for you to tell us all about it!! how fun this weekend looks!! I love it! It looks like you had a great time!! Great pictures girl!! Love it - great summary! We're getting booked up for 2014 as soon as we can. Then we'll start working on the playlist! after following your pics on IG this weekend I found myself planning a trip like this in the future for us haha!! Seriously it looks like a blast! Reminds me of taking a trip with my family in Wisconsin a few years back... cabins, nightly bands/dances, activities... so much fun! So much fun! I haven't been camping in quite a while, but you've given me the bug! This looks like the best time!! 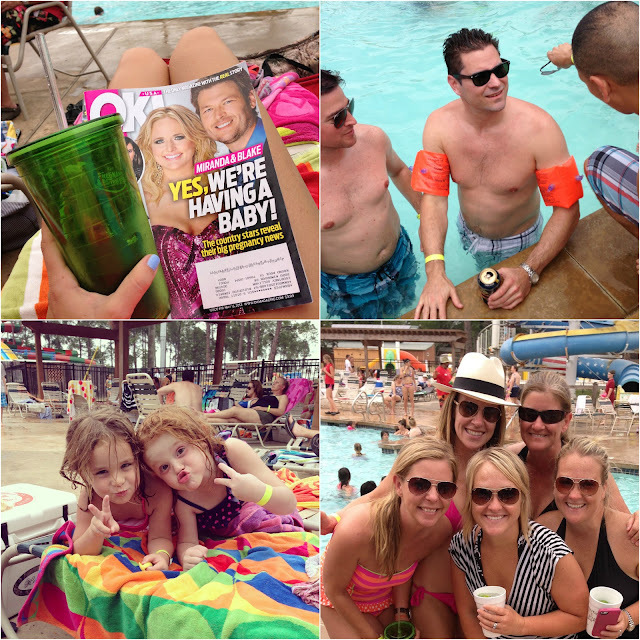 Loved following along all weekend via IG! Do you know where the styrofoam cups were ordered from? We have a few adventures this summer that we may need those for. Great guide and tips! This looks SO FUN. Looks like you guys had a BLAST!!!! Wow! I can't believe you fit all of this into one weekend! Looks like fun! I went camping a lot as a kid but I've never been "glamping" haha... I think that sounds a lot better! I'm all for camping with amenities!! No roughing it for this girl. Looks like sooooo much fun!!! RV'ing does sound like a lot of fun except I'd be terrified to drive it and all the other extra work you mentioned that I had no clue about. Awe. This reminds me of when I glamped in PA and we went shooting paint balls in the woods. But you had slides so this was even more fun. Now I wanna go glamping! It all would have been worth it just to see the wedding if you ask me. This looks like fun, sounds like you had a total blast! This is seriously awesome!!!! I love every single thing about this post and I'm going to try to convince my husband to sign us up for next year just so I can hang out with you and all your amazing new glamping buddies. :) Love it! So I'm sending this to my blogging bff shannon because we're definitely going glamping this summer and I need her to know what to expect. This looks like A BLAST!!! I love me some glamping, camping, everything! FACEBOOK OFFICIAL! Seriously, I was dying over your IG pics all weekend. Dying of jealousy. SO MUCH FUN. This actually looks like so much fun. I've considering camping before but the idea of staying in a tent freaks me out, I think glamping is much more my style. Now glamping is the kind of camping I can get down with! This looks like a blast. I love that the kids do karaoke. So cute! Glamping is clearly the way to go! Everyone deserves a weekend like this, whether it's Jellystone or somewhere else, just surrounded by good times and love! I cannot stop laughing at this post!! I'm so glad you had such an amazing weekend! You have great friends and you make new (and famous) friends so easily! Oh wow, this is so close to Houston! We will be going next year for sure! I'm dying! This looks so fun and your pictures are hilarious! I want to go "glamping", but only if I can go with you! omg i'm dying. this looks absolutely amazing! i havent been there since i was maybe 8?! so fun. why didn't i think to get married there? So much fun!!! I think that "glamping" will have to be in our future! Those little cabins are quite cute! That looks like the best camp site ever!! My glamping experience involved AC'd cabins but no water slides or pool, bummer. And where did you get that super cute swim suit? I love it!